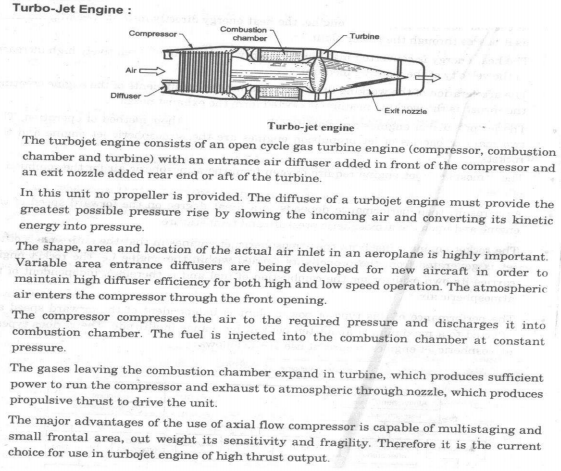 Draw the schematic diagram of turbojet engine. 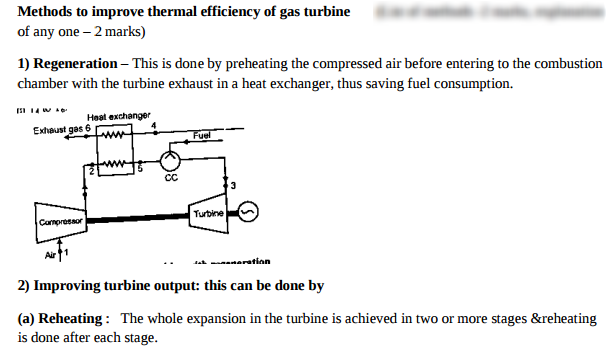 Explain regeneration method to improve thermal efficiency of gas turbine with the help of flow diagram and T-S diagram. 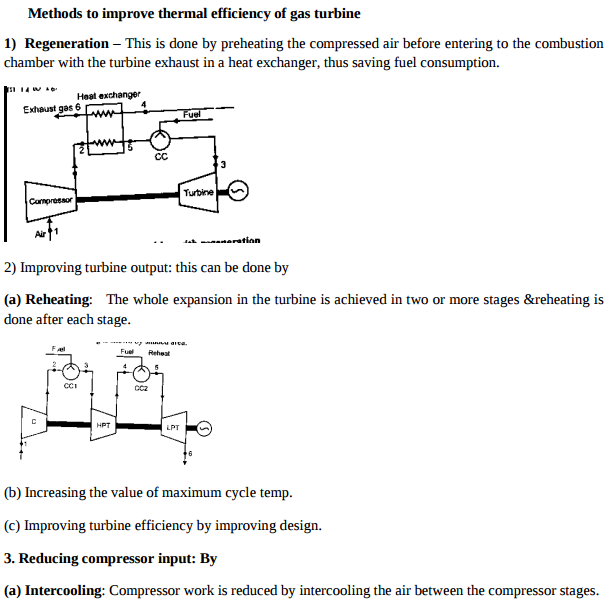 Regenerative method to improve thermal efficiency in gas turbines : The exhaust gases a lot of heat as their temperature is far above the ambient temperature . 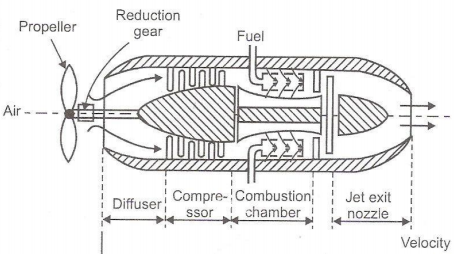 The heat of exhaust gases can be used to heat the air coming from the compressor thus reducing the mass of the fuel supplied in the combustion chamber as shown in the figure. This method is called regenerative method. 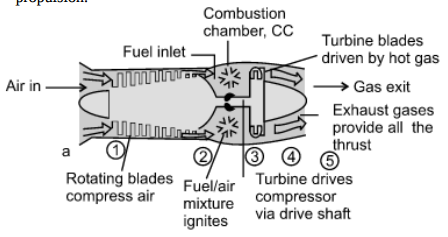 Working principle of Turbojet: shows the schematic of turbojet engine. It has a diffuser section at inlet for realizing some compression of air passing through this section. Due to this air reaching compressor section has pressure more than ambient pressure. This action of partly compressing air by passing it through diffuser section is called “ramming action” or “ram effect”. Subsequently compressor section compresses air which is fed to combustion chamber and fuel is added to it for causing combustion. 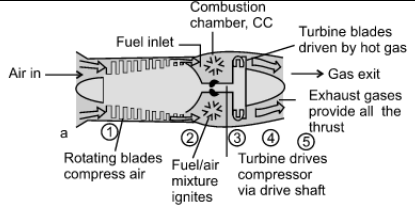 Combustion products available at high pressure and temperature are then passed through turbine and expanded there. 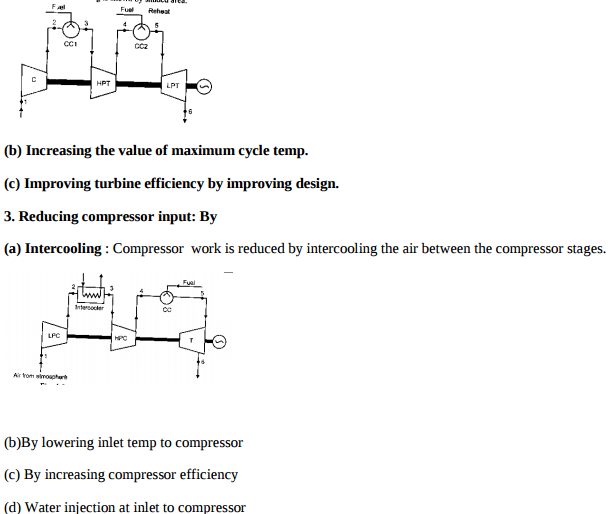 Thus, turbine yields positive work which is used for driving compressor. Expanding gases leaving turbine are passed through exit nozzle where it is further expanded and results in high velocity jet at exit. This high velocity jet leaving nozzle is responsible for getting desired thrust for propulsion. 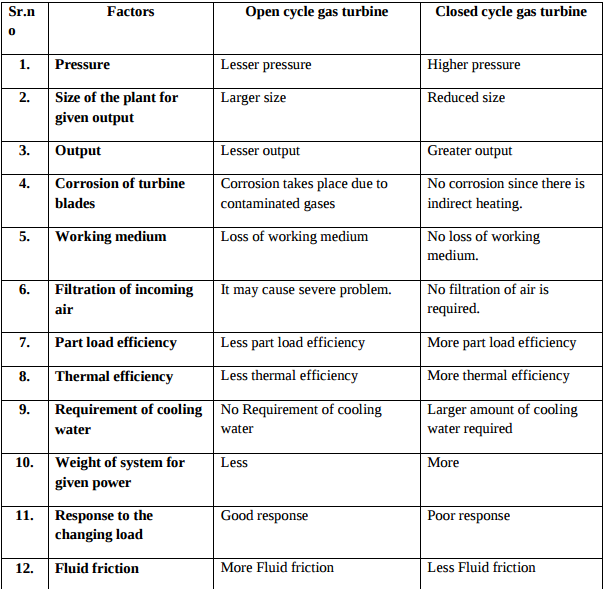 State the advantages of closed cycle gas turbine over open cycle gas turbine (any four). 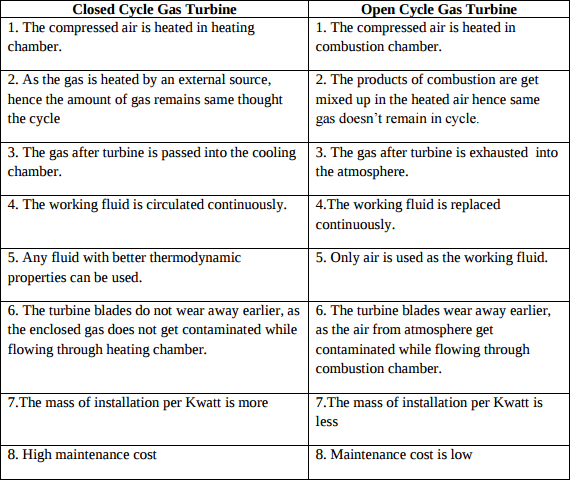 Advantages of closed cycle gas turbine over open cycle gas turbine: (i) It has higher thermal efficiency for the same minimum and maximum temperature limits and for the same pressure ratio. (ii) Since the heating is external, any kind of fuel even solid fuel having low calorific value may be used. (iii) There is no corrosion due to circulation of combustion product. (iv) As the system is a closed one there is no loss of the working fluid. (v) The size of the turbine will be smaller compared to an open cycle gas turbine of the same output. (vi) The regulation is more simple. (vii) The heat transmission coefficient in the exchanger is better due to the increase in suction pressure. 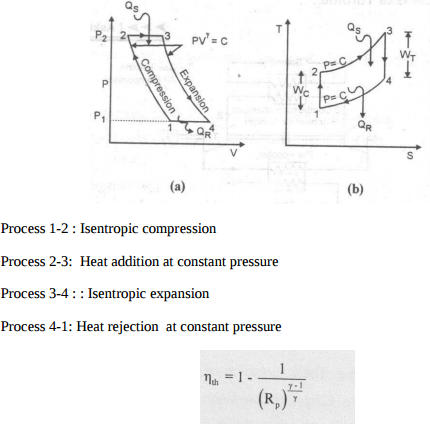 (viii) Loss due to fluid friction is less due to higher Reynolds number. 1. It is used for electric power generation. 2. It is used for locomotive propulsion. 3. It is used for ship propulsion. 4. Gas turbine is used in aircrafts. 5. It is used for supercharging for heavy duty Diesel engines. 6. Used in turbo jet and turbo-propeller engine. 7. It is used for various industrial purpose such as in steel industry, oil and other chemical industry. 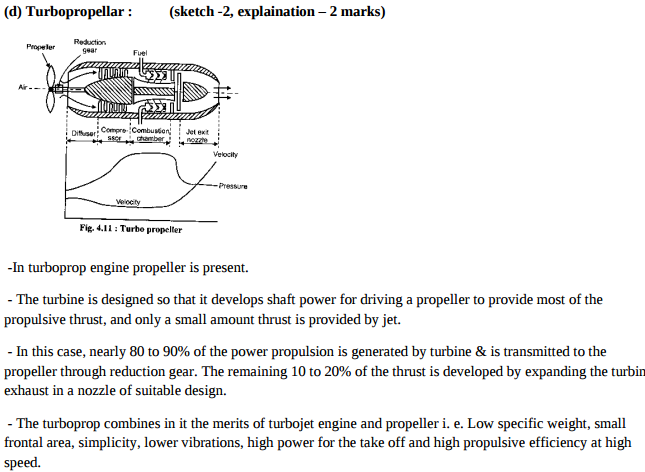 Explain the working of ‘Turbo-Prop’ engine with neat sketch. The main components of turbo-prop engine are a propeller, gear reduction unit, a compressor, a combustor, gas turbine and the nozzles. In this engine 80 to 90% of the total propulsive thrust is generated by the gas turbine and the remainder is developed by the expansion of the gases in nozzles. Due to this the power generated in the gas turbine is used for driving the compressor and the propeller, while in case of turbojet engines the turbine power is only used to drive the compressor and the auxiliaries. The gas turbine drives the propeller through the reduction gear unit and it draws a large amount of air. A large part of this air drawn by the propeller is passed through the ducts around the engine and the remainder is compressed in the diffuser by ram compression and further in the compressor. Fuel is burnt in the combustor and the resultant high temperature gases are expanded in the turbine and finally in the nozzles. The total thrust developed is the sum of thrust developed by the propeller and the nozzle. Unlike the turbojet engines the turboprop engines are widely used for commercial and military air crafts, due to their low specific fuel consumption and high flexibility of operation at reasonably high speed. 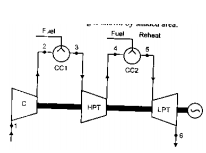 Explain any one method to improve thermal efficiency of gas turbine with the help of block diagram. 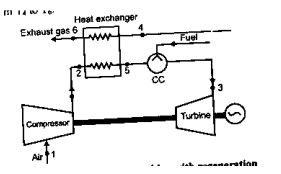 Explain intercooling and reheating in gas turbine with the help of T-S diagram. 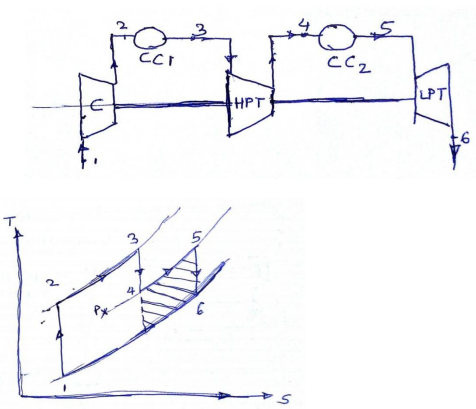 LPC – LOW pressure cylinder HPC – high pressure cylinder CC – combustion chamber T – Turbine ( 2+ 2 marks) The net work of gas turbine cycle may be increased by saving some compression work. 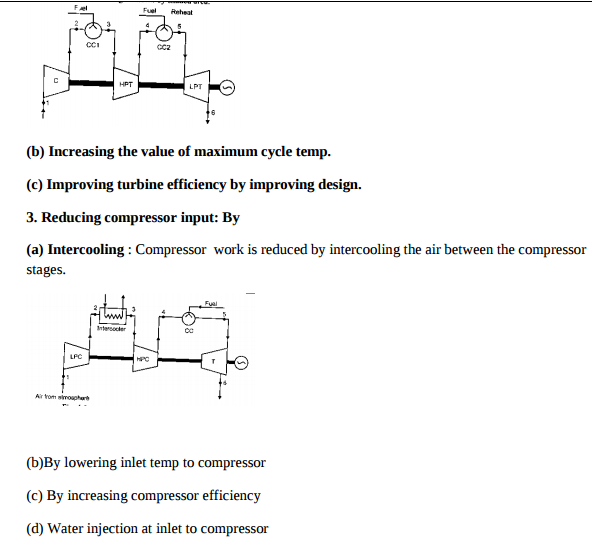 This is done by using several stages of compression with inter cooling of air between stages. 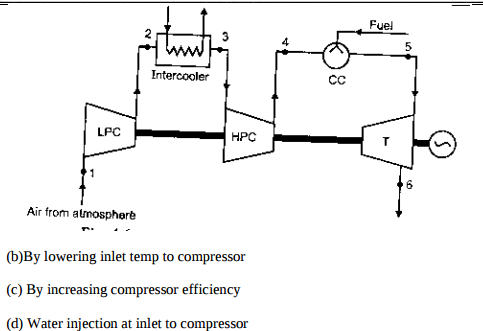 The air from first stage of compression is cooled in inter cooler approximately to its initial temperature before entering to second stage of compressor. The effect of inter cooling is to decrease the network and increase the efficiency as compared to the simple ideal cycle without inter cooling. 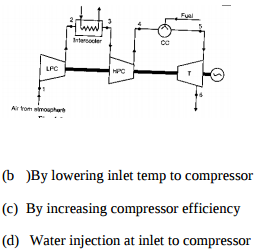 The ideal open gas turbine with inter cooling can be shown as 1 – 2 – 3 – 4 – 5 – 6 In first stage compressor atmospheric air is compressed from P1 to P2, it is them cooled from temperature T2 to T3 = T1 in the inter cooler at constant inter mediate pressure Px and finally compressed from Px to P2 in second stage or compressor. Working principle of jet propulsion - Jet propulsion is based on Newton’s second law and third law’s of motion. - Means producing forward axial thrust by means of reaction of jet of gases which are discharged rearward with a high velocity (aircraft, missile & submarine) - As applied to vehicle operating in fluid, a momentum is imparted to a mass of fluid in a such a manner that the reaction of imparted momentum furnishes a propulsive force. The magnitude of this propulsive force is termed as thrust. - For efficient production of large power, fuel is burnt in an atmospheric of compressed air combustion chamber, the product of combustion expanding first in gas turbine which drive the air compressor and second in nozzle from which thrust is desired for turbojet engine. 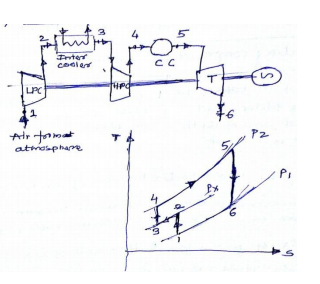 Draw constant pressure closed cycle gas turbine on P.V and T-S planes. Name the various processes involved and give its efficiency equation with meaning of each term. 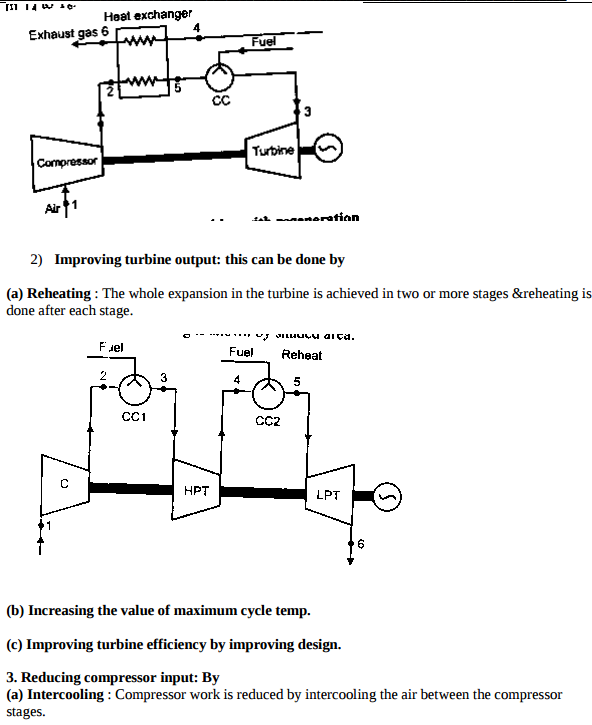 State the different methods used to improve thermal efficiency of gas turbine. Explain any one in brief. Methods to improve thermal efficiency of gas turbine 1) Regeneration – This is done by preheating the compressed air before entering to the combustion chamber with the turbine exhaust in a heat exchanger, thus saving fuel consumption. 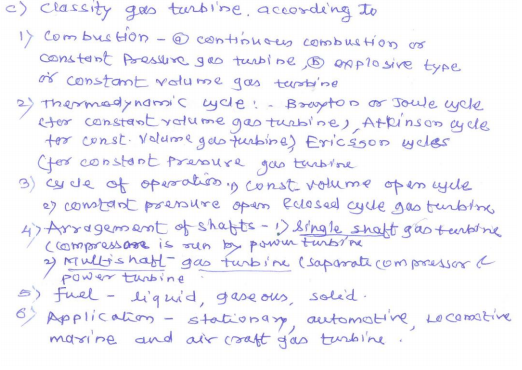 State merits/demerits of gas turbine over T.C. engine with respect to following parameters: (i) mechanical efficiency (ii) starting trouble (iii) weight per power (iv) part load thermal efficiency. Ramjet – it consist of inlet difference, combustion chamber and tail pipe (exist nozzle) Ramjet has no compressor as the entire compression depends upon compression. Function of supersonic & subsonic difference to convert the kinetic called the ram pressure. Working:- The air entering into ram jet with sup sonic speed is slowed down to sonic velocity in the air pressure is further increase in the sup sonic different increasing also the temperature of air. The diffuser section is designed to get correct ram effect its into decrees the velocity & increase pressure of in cooling air. The duel injected into combustion chamber is burned with help of igniter the high tress engine temperature garb are passed through the nozzle converting into pressure energy into kind energy. 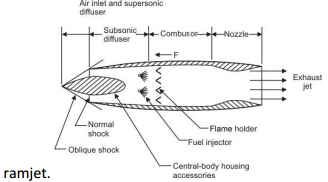 The high velocity gas leaving the nozzle provide required toward thrust to ramjet. Limitation 1. Ramjet engine be launched from an air plane flight. 2. Fuel consumption is too large. The fuel consumption lower decrees flight need. Ramjet has no compressor as the entire compression depends upon compression. Function of supersonic & subsonic difference to convert the kinetic called the ram pressure. Working:- The air entering into ram jet with supersonic speed is slowed down to sonic velocity in the supersonic diffuser ,increasing air pressure. The air pressure is further increase in the subsonic diffuser increasing also the temperature of air. The diffuser section is designed to get correct ram effect. it’s job is to decrease the velocity & increase pressure of incoming air. The fuel injected into combustion chamber is burned with help of flame igniter. The high pressure and high temperature gases are passed through the nozzle converting into pressure energy into kinetic energy. 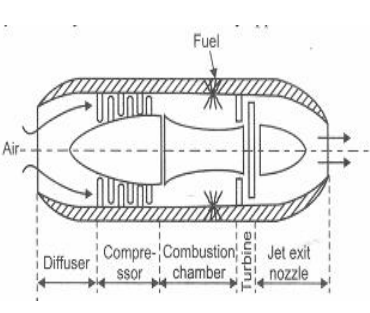 The high velocity gas leaving the nozzle provide required toward thrust to. Advantages of jet propulsion – 1. Higher mechanical efficiency due to absence of reciprocating parts. 2. The weight of gas turbine per kW power developed is low since the working pressures are low requiring lighter construction. 3. Can produce much more power at much higher altitudes where drag is less so higher speeds are possible and they are more efficient. 4. Reliability is one of the elements of success for jet engines. They only have a couple of moving parts and almost no vibration. 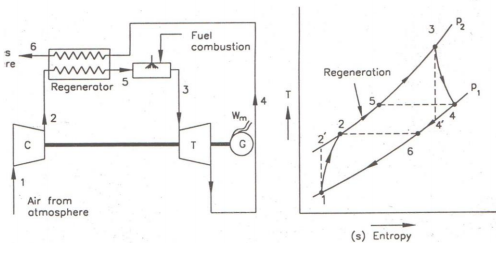 1) Regeneration – This is done by preheating the compressed air before entering to the combustion chamber with the turbine exhaust in a heat exchanger, thus saving fuel consumption. 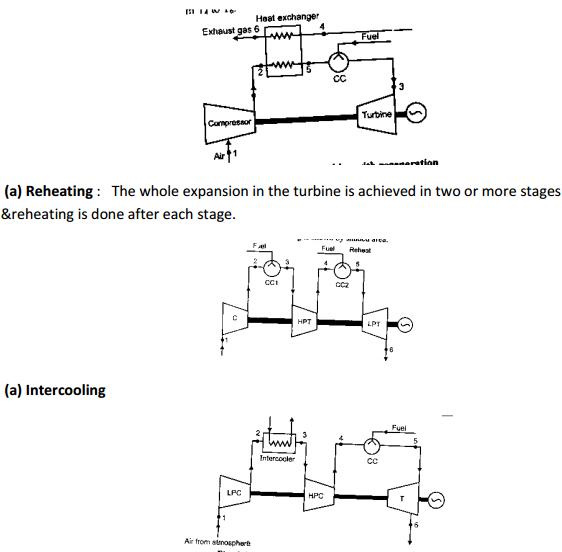 2) Reheating : The whole expansion in the turbine is achieved in two or more stages & reheating is done after each stage. That increase in work done. 3) Intercooling –The compression is performed in two or more stages. But between two stage there is intercooler where cooling takes place at constant pressure.To increase net work of gas turbine by saving some compression work. 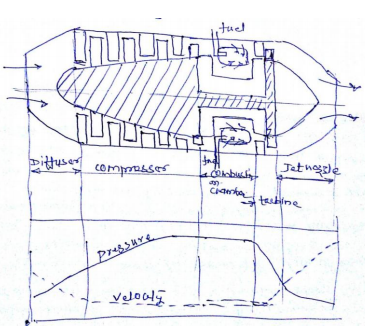 Working principle of Turbojet: shows the schematic of turbojet engine. It has a diffuser section at inlet for realizing some compression of air passing through this section. Due to this air reaching compressor section has pressure more than ambient pressure. This action of partly compressing air by passing it through diffuser section is called “ramming action” or “ram effect”. Subsequently compressor section compresses air which is fed to combustion chamber and fuel is added to it for causing combustion. 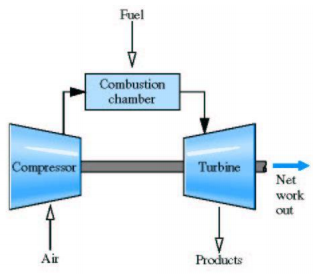 Combustion products available at high pressure and temperature are then passed through turbine and expanded there. 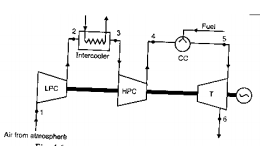 Thus, turbine yields positive work which is used for driving compressor. Expanding gases leaving turbine are passed through exit nozzle where it is further expanded and results in high velocity jet at exit. This high velocity jet leaving nozzle is responsible for getting desired thrust for propulsion.